BASED ON RESEARCH BY VERY SMART PEOPLE! HOW DOES THE 5 SECOND JOURNAL WORK? This journal’s layout has been carefully designed to leverage the best psychology, organizational behavioral, and neuroscience research. You won’t just get more done–you’ll do it in half the time. Your life is way too important to spend it procrastinating. Invest a little time in here every day and in return you’ll get the best tools psychology, organizational behavioral, and neuroscience have to offer. Stop making your brain work so hard. The Zeigarnik effect is the psychological phenomenon in which your mind focuses on unfinished tasks because your brain doesn’t want to forget them. Writing down your to-dos gives your brain permission to relax its circuits and lets you focus on what really matters–leaving analysis paralysis in the dust. Confidence is a skill YOU can build. Yes, you. And it’s not as difficult as you may think. Every day this journal will give you a chance to step outside your comfort zone so you can feel proud of yourself and watch your self-confidence grow. Want to live a more passionate life? Stop focusing on sh*t that drains you. Seriously. This journal will show you a cool way to power up your energy levels and tap into that inner zen that knows exactly what fuels your fire. If you get to the end of the day and wonder where it all went, it’s time to take stock. Using research from Harvard Business School, you’ll learn one simple mindset trick that keeps you present to what matters most, which is the secret to being in control. Science proves that your mood in the morning impacts your entire day. That’s why this journal is designed to boost your mood first thing, so you can become a happier, smarter, and more positive person all day. The fact is, happier people get sh*t done. Get off the spinning hamster wheel of to-dos and put your top priority first by setting a daily goal. Research shows that your chances of success are greater when you channel all of your energy into one thing. Research also shows that setting goals makes us happier, gives your life meaning, and suppresses negative emotions–and writing your goals down increases rates of completion from 43% to 76%. The 5 Second Journal was created for real people who might miss a couple days of journaling, have a desire to quit forgetting their best friend’s birthday, and want to bring out the badass within by using a simple and science-back solution proven to get the important (and real life) sh*t done. DO YOU WANT TO CULTIVATE ROCKSTAR CONFIDENCE? 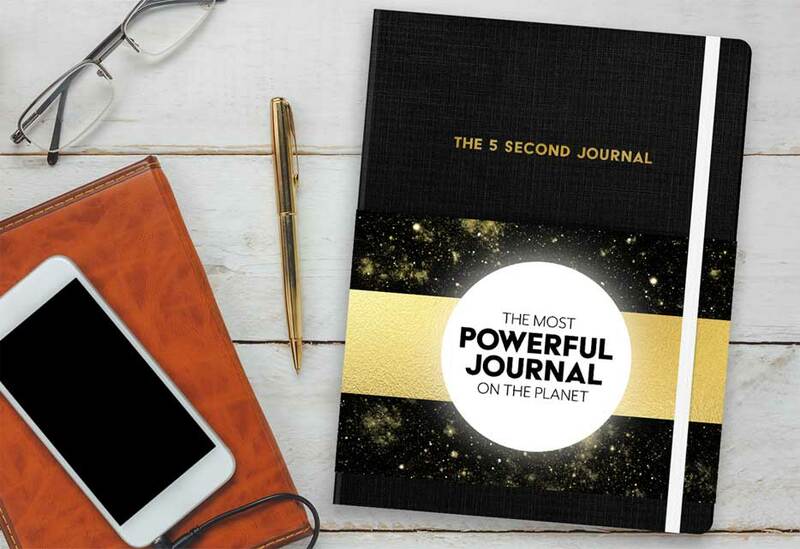 SIGN UP HERE FOR YOUR FREE 5 SECOND JOURNAL COMPANION GUIDE FILLED WITH 50 DAYS OF CONFIDENCE CHALLENGES THAT WILL HELP YOU CREATE SMALL WINS TO BUILD YOUR CONFIDENCE.